Keene's 8 Inch Dredges are the gold standard (punn intended) for the most substantial, professional yet portable dredges on the market today. 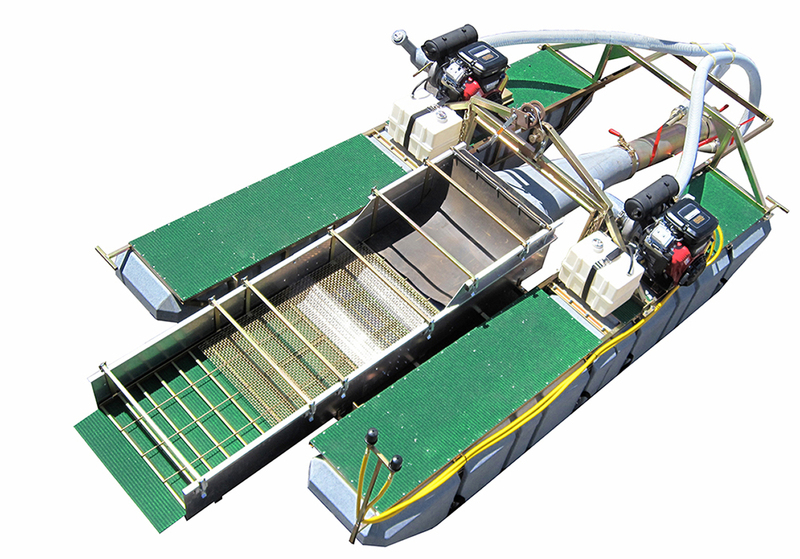 This is one of the most cost effective and economical dredges in the industry. Both of these dredges are powered by two light weight engines as apposed to one larger, heavier engine which also increases maneuverability. Smaller engines means that they can be transported by hand without the need of larger equipment for transport. The 8246V and 8246VE are mounted on flotation modules that feature large carpeted decks that provide excellent traction and work space. The 8246VE sluice box has been extended to 16 feet in length. The first section is our 3-stage sluice box for fine & coarse gold and the second half is dedicated for the efficient recovery of gemstones. Both of these dredges are powered by twin 23 horsepower, commercial Vanguard gasoline engines with electric starter, for long life, reliability and economy. These models include separate 5 gallon gas tanks that mount on the float for ease of refueling as well as extended running time. The suction system has an over-sized power jet and twin injectors for maximum suction power to reduce the occurrence of rock jams. This is probably the most portable 8 inch dredge on the market. All of the components can be broken down into small enough sections so that they can easily be carried by hand. The 8246's are equipped with a 263 compressor for an ample air supply that can accommodate two divers. These models are designed for ease of assembly and operation in the most severe of conditions. This is the lightest of all our eight inch dredges. 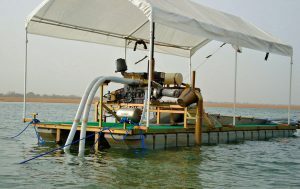 Our compact dredge system is powered by a Kohler Command Pro 1000 37 horsepower engine is direct mounted to a P1500 pump. Featuring a separate deck mounted 10 gallon gas tank. Equipped a 263 air compressor providing an ample air supply for two divers. This dredge provides extraordinary suction power enabling dredging to depths of 40 feet. 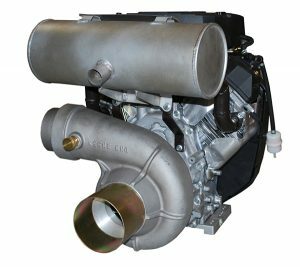 The engine, pump and compressor package weighs under 200 pounds making it the lightest and quietest engine package available today. 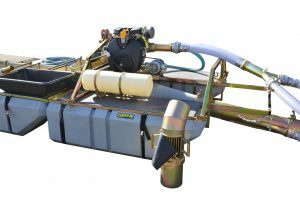 The engine features a 2 year warranty and operates on approximately 1.5 gallons per hour making it one of the most economical 8 inch dredges on the market. The suction system is equipped oversized power jet and twin injectors for maximum suction power and to reduce occurrence of rock jams. This dredge is also equipped with a secondary dredge system that can vacuum the concentrates from the sluice box while in operation. The concentrates can then be transported to shore and processed through other separation methods. The ability to clean the sluice box and operate continuously greatly enhances both recovery and productivity. Call us today and let us configure a package that is perfect for your needs! 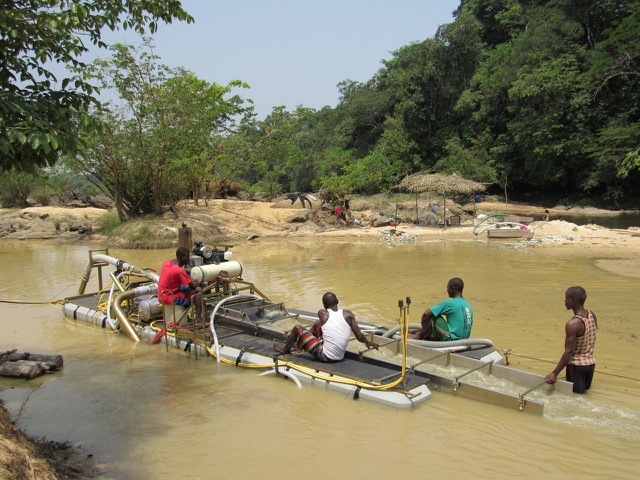 Our 8142DE dredging for fold and diamonds in Liberia. 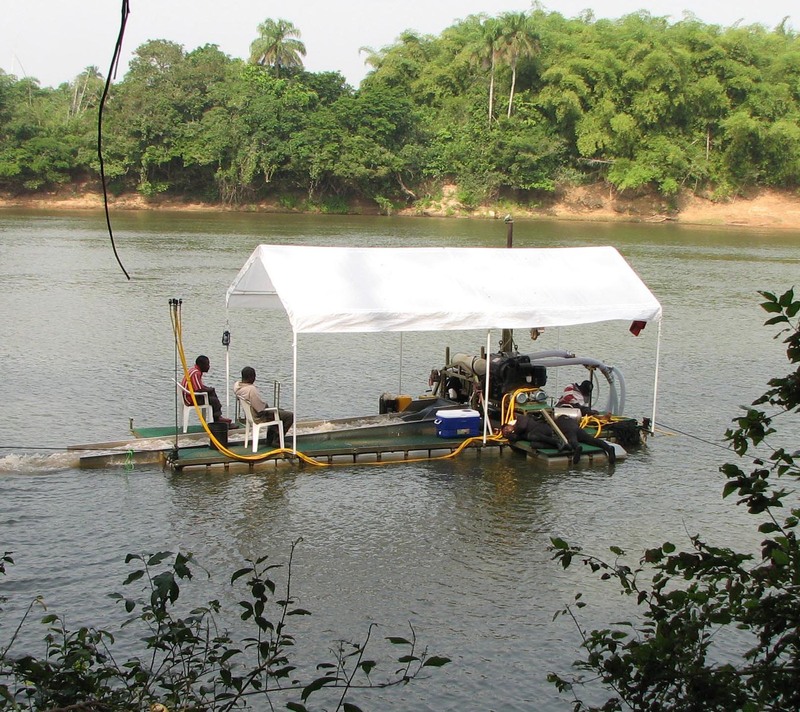 This our lightest and most portable diesel powered dredge specifically designed for the recovery of both gold and gems. Powered by a lightweight 4-cylinder turbo charged 42 horsepower Kubota diesel engine that provides extreme high performance, reliability and economy. The Kubota diesel engine drives our reliable P1500 pump that produces 1500 gallons per minute providing ample suction for depths up to 45 feet. This engine and pump combination provides extremely low fuel consumption. 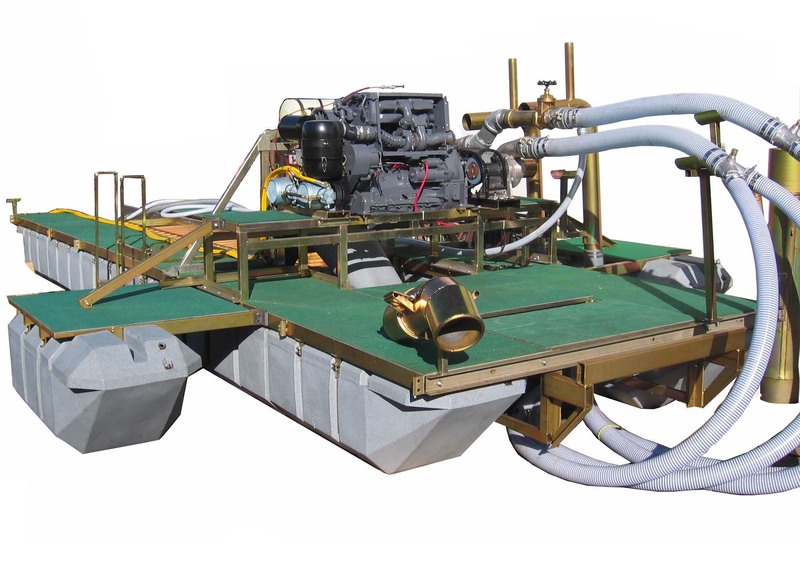 It is one of the world’s lightest, quietest and most compact industrial diesel powered dredge, period. 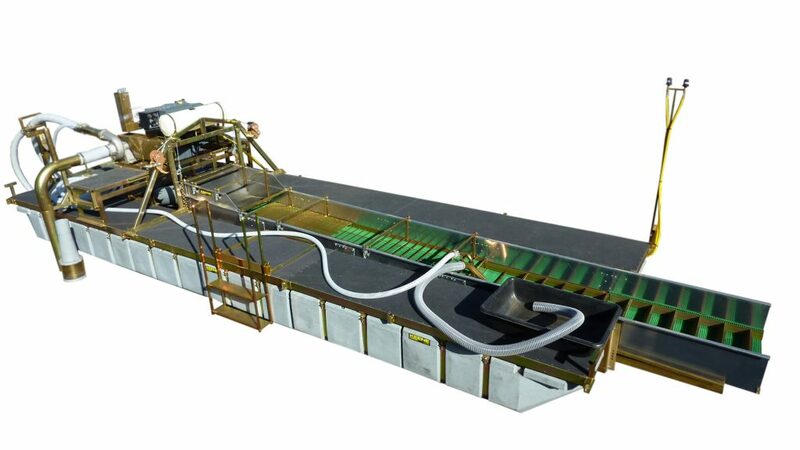 The sluice box contains our world famous 3-stage sluice recovery design. The first eight-foot portion of the recovery box is designed to capture all the fine & coarse gold. The last 8 feet is primarily for diamond and gem recovery. 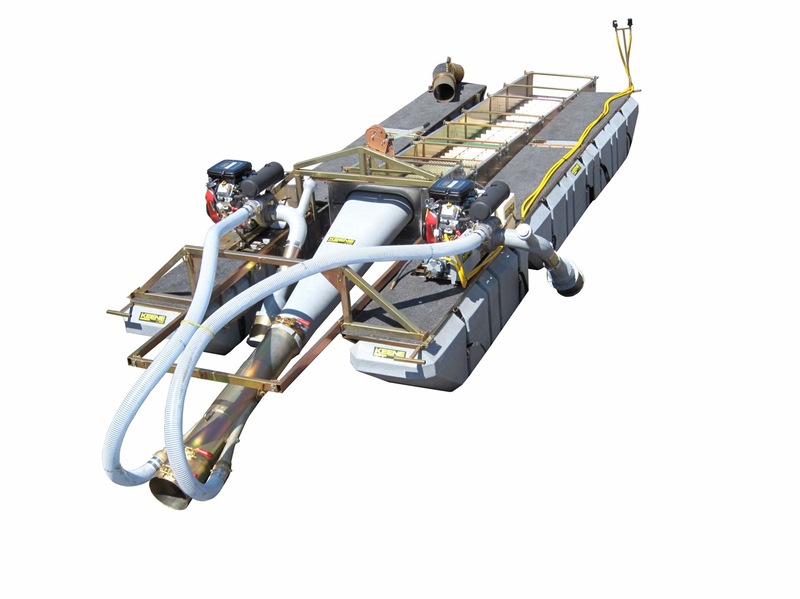 This dredge can be disassembled into small lightweight components for ease of transportation. This dredge is so light that it can easily be hauled in the back of a truck. The engine and pump combined weigh only 500 pounds which is several hundred pounds lighter than other diesel engine and pump combinations. The dredge deck is 24 feet in length and provides a spacious platform in front of the engine measuring 8 feet wide by 6 feet long. 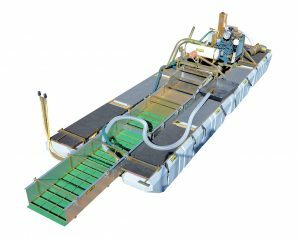 This dredge is also equipped with a secondary dredge system that can vacuum the concentrates from the sluice box while the primary dredge is in operation. The concentrates can then be transported to shore and processed through other separation methods. The ability to clean the sluice box and operate continuously greatly enhances both recovery and productivity which provides non stop operation. 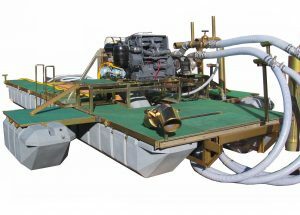 This 8 inch commercial dredge is ideal for gold and gem recovery. 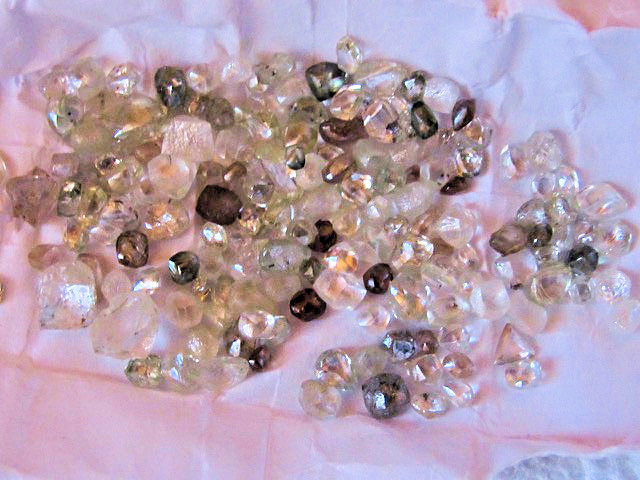 Diamonds recovered from a Liberian dredging operation using our 8142DE. Model 8142DE Gold and Gem Dredge. This 8 inch commercial dredge is ideal for gold and gem recovery. Powered by an efficient 67 hp Deutz diesel engine driving our high performance P1500 pump. The P1500 pump produces 1500 Gallons per minute providing ample suction for depths to 50 feet. Equipped with our new advanced jet flare and non-clogging suction system, assuring little or no down time for rock jams. An air supply for 2 divers provided by a heavy duty 263 air compressor. up device or into storage containers. The concentrates can then be transported to shore and processed through other concentrating methods. The ability to clean the riffles and operate continuously, greatly enhances both recovery and productivity. This dredge is capable of handling a variety of different engine and pump combinations for special applications. The 8160 dredge easily disassembles into small sections for transporting. The 8195D dredge is mounted to modular decks system measuring 8 feet wide and 24 feet long providing larger deck space and is also equipped with additional outrigger flotation measuring 45 x 42 inches to support the additional weight. The frame is constructed of a zinc plated steel frame with indoor-outdoor carpet fastened to aluminum decks. The flotation is provided by fourteen high impact plastic polymer pontoons for ample support to accommodate fast and rough water conditions. 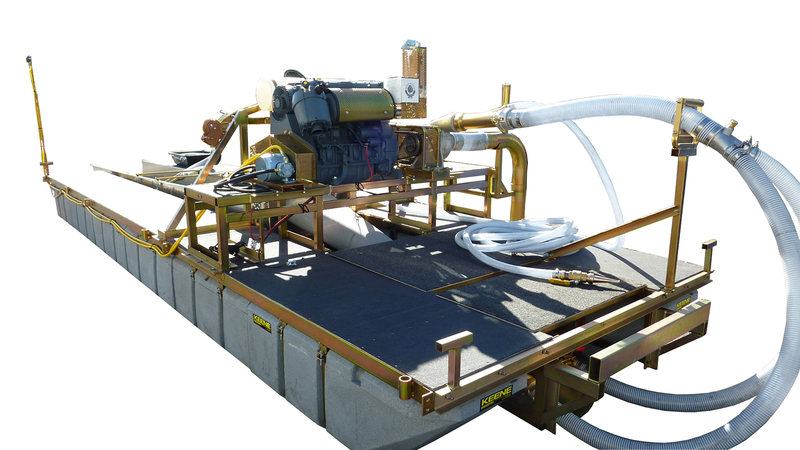 We use a four injector power jet vacuum system providing an increased vacuum for dredging material from deep depths. The dredge is equipped with 40 feet of suction hose and can handle up to 100 foot of suction hose and dredge to depths exceeding 80 feet. world. Ideal for the recovery of heavier specific gravity materials including diamonds, sapphires, rubies, garnet and any gemstone that has a heavier specific gravity than quartz. Includes the same special suction clean out system as the Model 8160, this system can vacuum the values from the sluice during operation and can eliminate the possibility of theft. Allows for removal of material to a secure area for further processing and provides a non stop dredging operation. 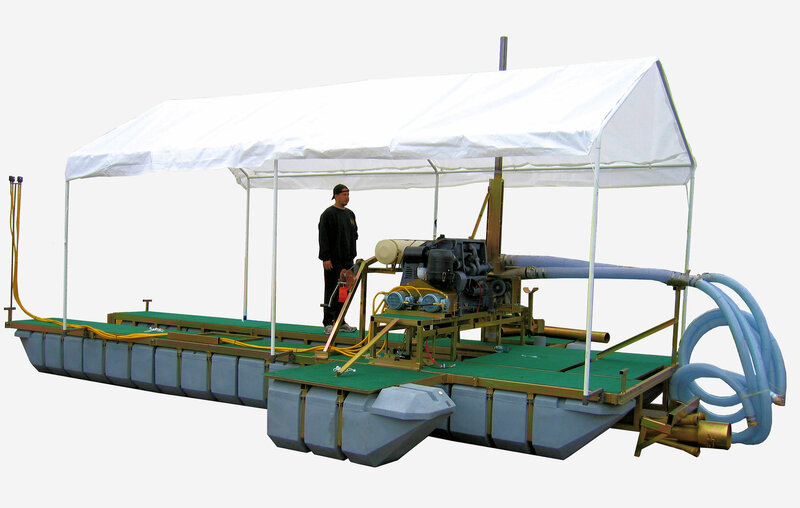 The dredge is designed for easy set-up and operation and does not require professional assistance. The flotation is capable of accommodating hundreds of pounds of additional weight. We pride ourselves in the simplicity of the dredge and its ability to continue to operate on a trouble free basis. We have chosen the Deutz diesel engines due to long reliable life and availability of spare parts in third world countries such as Africa.